WASHINGTON, Jul 18 2013 (IPS) - In the aftermath of the recent acquittal of 31-year-old Florida native George Zimmerman, the state’s so-called Stand Your Ground law has come under national scrutiny, as have dozens of other states that have enacted similar legislation. The criticism will perhaps be led by whatever the U.S. Justice Department chooses to do with the case. U.S. Attorney General Eric Holder denounced the law Tuesday in a keynote address at an annual convention of the National Association for the Advancement of Coloured People (NAACP), an esteemed advocacy group. During his speech, Holder also pledged to open a full investigation into the death of Trayvon Martin, the 17-year-old African-American youth whom Zimmerman, a Latino, fatally shot in February 2012. 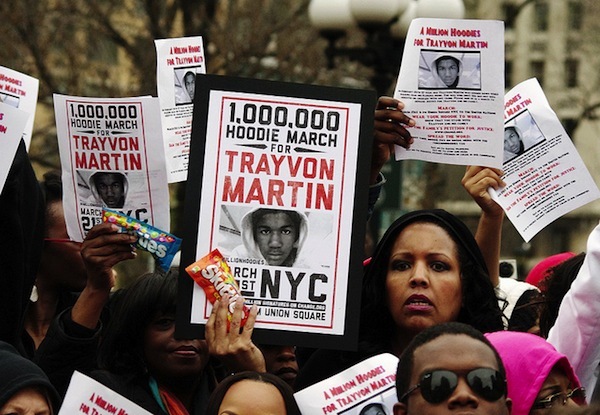 Over the past two months, Zimmerman’s case has riveted U.S. audiences and sparked a countrywide discussion of the role of race – and racial profiling – in the United States today. "We must..take a hard look at laws that contribute to more violence than they prevent." Florida’s Stand Your Ground law was passed in 2005 with a unanimous vote in the state senate and a 94-20 vote in the house. Five years later, the rate of so-called justifiable homicide in Florida had tripled. And since 2005, 31 other states have followed Florida’s lead in passing similar “self-defence” laws. Under the Florida law, a person can use “defensive force” that is intended to cause harm to another person if they feel “reasonably” threatened – say, if someone is breaking into their house or if they are beaten or kidnapped. The law does not apply if the person against whom defensive force is used has a right to be on the property or is a law-enforcement officer. “A person who is not engaged in an unlawful activity and who is attacked in any other place where he or she has a right to be, has no duty to retreat and has the right to stand his or her ground and meet force with force, including deadly force is he or she reasonably believes it is necessary to do so,” according to the Florida law. The law also states that if a person is being unreasonably attacked, they have no obligation to retreat. This element has led to increasingly strident criticism from those who worry the law results in escalation, rather than de-escalation, of potentially violent situations. Such a dynamic appears to have taken place in the ensuing fight between Zimmerman, an armed “neighbourhood watch” volunteer, and Martin in February 2012. Some suggest the law is a solution looking for a problem and point out that there was no evidence of any such problem prior to the signing of the Stand Your Ground law in Florida. “It [the law] allows someone to shoot and kill another human being in the fear of great bodily harm. Great bodily harm means a fist fight,” Ladd Everitt, director of communications at the Coalition to Stop Gun Violence, an advocacy group, told IPS. Zimmerman’s lawyers did not bring up the law during his trial, but it was included in the instructions to the jury, who acquitted him on Saturday, Jul. 13. “There has always been a legal defence for using deadly force if – and the ‘if’ is important – no safe retreat is available,” Holder noted Tuesday. The Immunity from Criminal Prosecution clause of the Florida law states that if the person who used defensive force in accordance with the law is granted immunity in court and wins the case, the prosecution is required to pay the defence’s attorney fees, court costs and compensation for any loss of income. Zimmerman did not file for immunity in the criminal court case that ended last week. “The attorney general fails to understand that self-defence is not a concept, it’s a fundamental human right,” Chris W. Cox, the executive director of the National Rifle Association‘s Institute for Legislative Action, the lobby group’s advocacy arm, said in a statement. Following the 2005 passage of the Stand Your Ground law, NRA operatives and legislators aligned with the conservative American Legislative Exchange Council (ALEC) and created a piece of model legislation mirroring the Florida law and which could in turn be passed throughout the country. ALEC encouraged and advocated this passage and initially called the legislation one of its successes. Subsequently, 49 major corporations, including General Motors, General Electric and Coca-Cola, severed ties with the organisation. ALEC has since abandoned its criminal justice task force that promoted the Stand Your Ground law and has disavowed gun bills. Thirty-one states, including Alabama, Georgia, Kentucky and Louisiana, currently have a Stand Your Ground law. Eight states have related bills in the legislature right now or are expected to have legislation introduced soon, including Alaska, Illinois and Massachusetts. California, Colorado and Washington do not have a bill, but Stand Your Ground actions have been upheld in their courts, making it a de facto law. Only seven states have no such laws or bills. The Zimmerman trial may have sparked pushback against this legislative trend, however. President Barack Obama “urges upon all communities to examine what we can do … to prevent these kinds of tragedies from happening in the future; and to reduce gun violence in general”, press secretary Jay Carney said during a press briefing at the White House on Tuesday. The president is also urging communities “to look at our laws and examine whether those laws that we have serve to reduce gun violence or, in some cases, inadvertently make the problem worse”. Holder sharpened this growing critique by suggesting on Tuesday that such self-defence laws actually undermine public safety. The NRA did not return calls for comment.